Through a national community college student reform movement that places students at the center of everything they do, community colleges have made collective gains in recent years in improving student retention and outcomes. 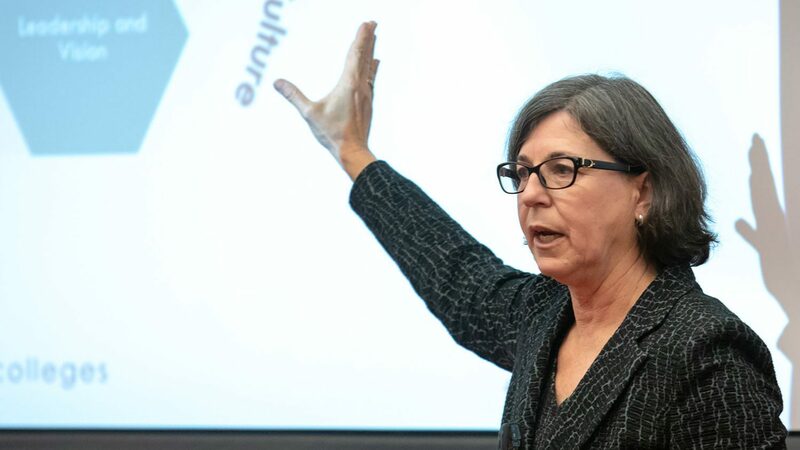 But these collective reform efforts still “have not yielded the desired results,” said Achieving the Dream President and CEO Karen Stout during the 2018 Dallas Herring Lecture she delivered Wednesday, Nov 28, at the NC State College of Education’s Friday Institute for Educational Innovation. A reason why community colleges are still not meeting their goals? Reform efforts “have lacked an explicit focus on improving teaching and learning as a primary lever for institutional transformation,” Stout said. Full time and adjunct faculty are using inclusive evidence-based instructional practices to foster student learning. Students are engaged as active learners in an accessible, empowering, personalized, and supportive academic climate. Institutions are creating an organizational culture that embraces professional learning for continuous improvement. Leaders must adopt continuous improvement models to drive innovation in curriculum and pedagogy. Leaders must invest in Centers for Teaching and Learning and align the work of the centers with their institution’s broader student-centered mission and student success agenda. Leaders must support faculty to approach their work from the diverse set of lived experiences, skills, and knowledge that their students bring to the campus and into the classroom. Leaders must develop and invest in an explicit adjunct faculty engagement strategy. Leaders can drive the design of a truly student-centered institution through teaching and learning.